Nowadays, it's not that difficult to assemble a battery pack. It's much more difficult to engineer a quality battery pack that will perform safely and reliably for several years. At SES we've been engineering batteries since 1993 and have a talented staff of engineers dedicated to make sure that the custom made battery we build should exceeds your expectations. All potential battery projects start with a feasibility study where our sales, engineering and production personnel analyze the Battery Design data provided by the customer. 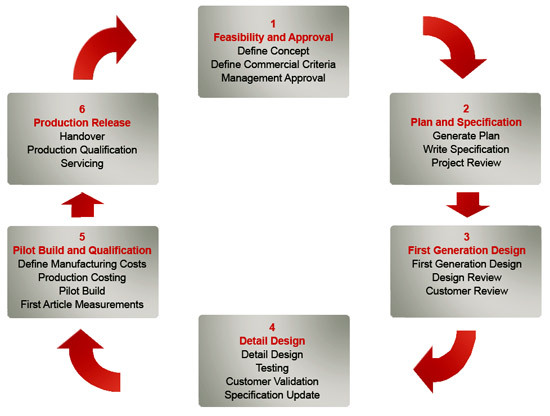 This is the first step to determine if we can provide the product that the customer wants. In some cases the type of cell dictates additional information from the customer to assure this cell can be used safely. At this point we will also determine what agency, compliance and transportation safety testing are required. The two most common reasons to reject a project is not enough space to provide the required watt-hour capacity and unreasonable cost expectations. If the project is feasible we initiate the assignment. Our in house engineering department is staffed by graduate electronic and mechanical engineers and front-end business co-coordinators. This team work with the customer and provide a conceptual battery pack design with an estimated cost including any testing and/or non-reoccurring engineering (NRE) costs if required. Often there is no NRE cost to the customer because we already have a similar design. If acceptable, either a pencil sketch or an AutoCAD® outline drawing is created for customer approval. A conceptual prototype may be built at this time. See Prototyping, below. If the customer approves the concept, the terms of sale are discussed including a payment schedule for any out-sourced engineering, custom circuits, injection molding or machining. If custom engineering and mold creation is required, our terms are 1/3 to start the project, 1/3 at acceptance of prototypes and 1/3 upon delivery of the completed battery pack. A non-cancelable, non-returnable purchase order may be requested at this time. During the design phase we try to utilize our extensive inventory of existing components suitable to achieve the battery solution needed by the customer. In the case of lithium-ion batteries this includes the Protection Circuit Module safety circuit (PCM) and battery charge status communication circuits if required. We have a list of ISO approved component vendors and sub-contractors for sourcing components that we do not have on our shelf. In the case where we need custom circuit boards or housings we have a strong relationship with our vendors. Every battery pack has two key parameters that need to be approved by the customer. Electrical Design : The battery must function and operate the host device, as well be able to be charged in case it's rechargeable. Mechanical Design : The battery must physically fit into or on the host device, including, but not limited to latching mechanisms. In either case, whether it is shrink-wrapped or in a custom housing, the electrical design is of first and foremost concern. We will provide a shrink wrapped prototype very early in the design stage to validate the electrical parameters (Sometimes within a week unless there is a custom circuit required that needs to be engineered ). Once the customer validates the electrical parameters, we can move on to the physical properties. This may take a number of months if there is a custom plastic or metal housing involved. At some point we will have prototype housings and other hardware items to verify and validate the mechanical design. This may also include prototype circuit boards. Once this second validation process is complete we can go ahead with finalizing the design and bills of material and release the battery to production. Adding a PCM or communication circuit is not as easy as buying them and soldering them in. The chips need to be matched to the battery pack and programmed with the characteristics of the cells to work properly. We have been using Microchip, TI, Seiko, Maxim and others for years, and know how to select the best circuit suited for the customers project. Some battery packs used pre-programmed circuits and others are programmed during the final QC process. If the battery design calls for a molded case, we use CNC sonic welders to bond the case into a completed pack. 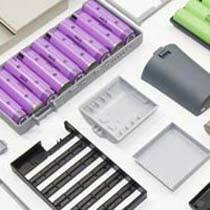 The injection molds are made in collaboration with our vendors that have their facilities in Ambala Cantt (Haryana). We either use the customers housing drawings or we create the design in house using AutoCAD® or SolidWorks® software. A conceptual drawing is forwarded to the customer for approval. Upon approval, before any machining is started, we will have a rapid prototype sample made of the housing so the customer can verify the fit into his device. We also have vendors that are capable of machining a housing out of a block of plastic and others who can form metal housings that can be screwed together. Either way, we can provide the customer with a complete battery pack solution.